February 23: Over 600 people marched through Todmorden in support of a protest against mass unemployment and the means test, organised by the National Unemployed Workers Movement. Five men including author William Holt were arrested when they tried to break into the Public Assistance Office. Charges included assault, unlawfully inciting others to obstruct the police, breach of the peace and unlawful assembly. March 16: Hearing of charges against the "Todmorden Communists" ended after 26 hours. They were committed for trial at Leeds Assizes. April 21: Rowdy demonstrations heralded the opening of the trial of five "Todmorden Communists." May 6: The trial ended. Despite an eloquent speech in which Holt - described as a Communist organiser and political agitator - denied the charges, he was jailed for nine months. Walter Newell, 36, and Edwin Rowan Howell, 24, were found guilty on various counts and were bound over. The two other defendants, Fred Sutcliffe, 38, and William George Silman, 56, were cleared. (Holt wrote about his experiences in "I Was a Prisoner" published after his release). 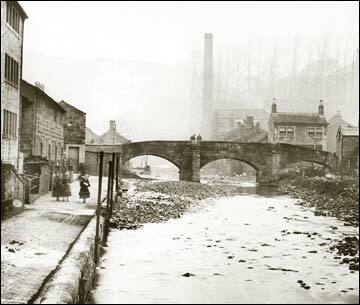 May 27: The old packhorse bridge in Hebden Bridge scheduled as an ancient monument. September 27: Public meeting held in Hebden Bridge voted in favour of Sunday opening of cinemas. November 19: Centenary of Luddenden Foot Methodist Church.